Scientific Inhalations has developed a unique inhalation device designed to provide an improved experience for its users over alternative devices. The device, named McFinn’s Triple-Filtered Waterpipe, consists of a glass bubbler and has two chambers containing different filter materials. The first chamber is filled with activated virgin coconut carbon and connected between the bowl and the water trap. The second filter contains organic cotton and is connected between the inhalation device and the mouth piece. numerous entities subject to no regulatory oversight, there is a potential risk that toxic levels of pesticide residues may be unknowingly consumed by patients. Although not yet directly quantified, additional health complications in patients may be a contingency of pesticide exposure. The primary goal of this study was to analyze to what extent pesticide residues may transfer into the smoke stream produced from cannabis when inhaled through McFinn’s Triple-Filtered Waterpipe and other comparable smoking devices commonly used by medical cannabis patients. Previous studies conducted with tobacco cigarettes have positively identified the transfer of pesticides such as pyrethroid residues into the smoke stream around 2-16%. Being there is a significant lack of regulations set in place for the medical cannabis supply, it is important that the potential for pesticide exposure is evaluated under the conditions the common cannabis user may experience. In order to determine the existence of pesticide residues in the cannabis smoke stream, a number of pesticides, which are readily available to the public and have a potential to be used by cannabis growers, were selected for the study. The pesticides include various insecticides, miticides, and acaracides, which are listed in Table 1. The smoking devices, which include a standard small glass pipe, McFinn’s Triple-Filtered Waterpipe without filters, and McFinn’s Triple-Filtered Waterpipe with filters installed as recommended by the manufacturer, were chosen to represent a generalized data set for standard smoking conditions as well as to evaluate the effectiveness of the McFinn’s Triple-Filtered Waterpipe in removing pesticide residues present in the smoke stream. A laboratory setup was constructed in which the mouthpiece of the smoking device was fixed to tubing leading to a cold trap containing an organic solvent at low temperature. Inhalations were simulated using a vacuum pump and timed valve. The settings were made such as to represent the smoking behavior of a typical adult person. The material used for this study was a single batch of medical cannabis which was prepared for use by applying ~750μg of each pesticide, diluted in acetonitrile (all pesticides adjusted for purity) one at a time to 5 separate sample lots containing ~2.3g of cannabis in round bottomed flasks. Each addition of pesticide was then mixed and partially evaporated to ensure the samples were homogenized. Each batch contained 4-5 pesticides and once all were introduced into the material, the samples were evaporated for an additional 20 minutes to further homogenize and dry the samples. The smoking procedure was carried out by passing the flame of a standard lighter over the plant material for 2 seconds at 30 second intervals while a slight vacuum was applied to the selected inhalation device. material used in the experiment. Figure 1: Comparative total recovery of pesticide residues from the “would be inhaled” smoke stream between the three devices. The results show a relatively large difference in recovery of residues between the different pesticides. This is due primarily to the stability of each compound and to what extent degradation occurs under the heated conditions along the length of the device. Between the different devices used, it is clearly evident that McDFinn’s Triple-Filtered Waterpipe with the cotton filters and activated virgin coconut carbon has a significantly lower recovery of pesticides residues remaining in the would-be inhaled smoke stream. This study clearly shows that McFinn’s Triple-Filtered Waterpipe inhalation device does filter out and reduce expose to a number of pesticides that may be found in the stream of medical cannabis smoke vapor. 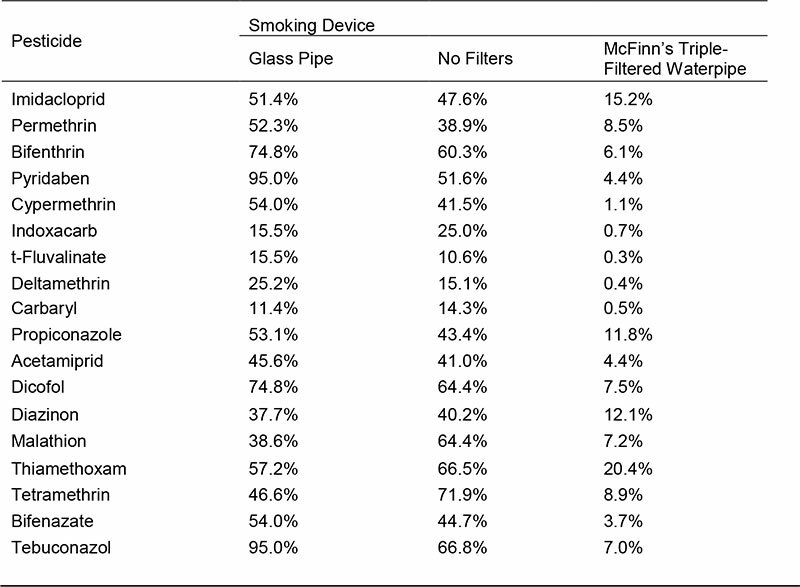 McFinn’s Triple-Filtered Waterpipe removed more pesticides in the smoke stream than a non-filtered waterpipe and a small hand-held glass pipe with similar levels of use. 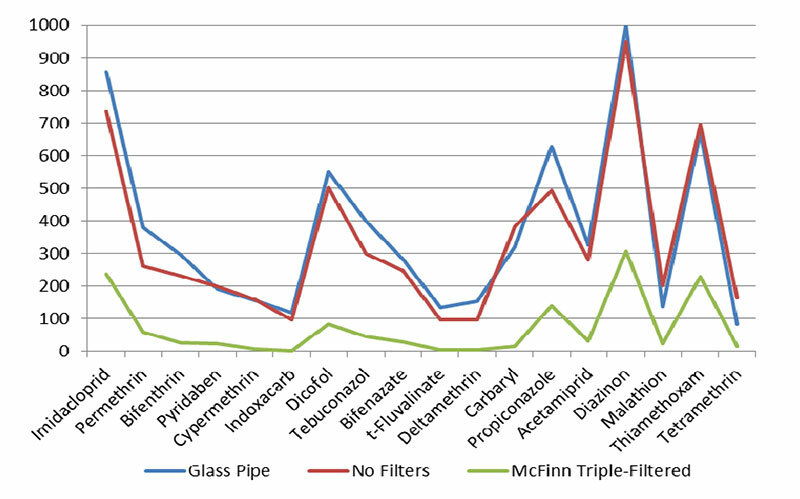 71.9% from the Waterpipe without filters, and 0.3% – 20.4% from McFinn’s Triple-Filtered Waterpipe with filters. The recovery levels from the unfiltered devices were alarmingly high, demonstrating the resilience of pesticides to heat degradation. When considering your medication and what it may be doing to your overall health, it is also important to consider exactly what you may, and may not, want to ingest. Utilization of filtered inhalation devices can offer reduction in the consumption of harmful contaminants that may be found on medical cannabis.